The tensions are undoubtedly rising along the Pacific, which continue to increase after North Korea raised the stakes in the region. New reports have suggested that North Korea has been seen on satellite imagery moving intercontinental ballistic missiles towards its western coast, which has created an alarm inside of Japan as to what the intentions of the rogue North Korea may be plotting next. North Korea insists it will strike anywhere in the world if it feels the desire to do so, and remains the most defiant government on the planet ignoring the pleas of the United Nations alongside its own neighboring states such as China and it's powerful pressures. Nothing seems to stop Kim Jong Un from acquiring a Nuclear Arsenal, possibly because history doesn't tend to favor those who cooperate with the demands of the United States and the United Nations, a La the Arab Spring and Libya, Egypt, Lebanon, and the many countries which were toppled by giving in. No, Kim Jong Un is determined to become a nuclear power and he doesn't care what anyone thinks about it. The problem being that Kim Jong Un is actually testing dangerously powerful <a href="http://thegoldwater.com/news/7502-Breaking-North-Korea-has-just-Detonated-a-1-Megaton-Thermonuclear-Warhead">1 Megaton Thermonuclear Warheads</a> which will send radiation across the globe and even threaten neighboring China. Now it appears as if the United States Air Force is monitoring the shift in arsenal towards the North Korean western shores, by sending nuclear sniffer planes from the Sea of Japan to spy on the rogue nation. This comes after North Korea has been observed moving what appeared to be an intercontinental ballistic missile towards its own west coast, South Korean media reported, citing an unidentified intelligence source. The rocket started moving on Monday, a day after North Korea's sixth nuclear test, and was spotted moving at night to avoid surveillance by the United States. North Korea has launch facilities for its missile program on its western coast, according to the United States. South Korea's Defense Ministry said that they were currently unable to confirm whether or not such a move was being made by North Korea, but the Ministry said in it's own parliament that North Korea was considered ready to launch more missiles, including ICBMs, at any time. It's believed that North Korea will indeed launch another intercontinental ballistic missile, one that would be capable of carrying it's newly successful thermonuclear device, in both a show of defiance and of force. The question now is how will the United States of America respond? Will Pacific Allies including Japan and Guam be threatened enough by the actions for the US to launch a premeditated strike of its own or simply blow the ICBM out of the sky? Most of the United State’s carrier fleet and strike force have been moved out of the region already. Since 1947, the United States Air Force has operated a nuclear explosions detection unit. The current fleet uses the WC-135 Constant Phoenix. The aircraft fly through clouds of radioactive debris to collect air samples and catch dust. By measuring their decay, fission fragments can be detected in minute quantities. The crew are kept safe using filters to scrub cabin air. Radiation levels are monitored using personal measuring devices for each crew member. Sniffer planes like Constant Phoenix can be rapidly deployed soon after a reported nuclear test and have been used to verify nuclear tests in North Korea in the past. This year, Constant Phoenix has reportedly been deployed in Okinawa, Japan and has had encounters with Chinese jets. On the ground, the Comprehensive Test Ban Treaty Organisation (CTBTO) operates 80 ground-based monitoring stations across the globe that constantly monitor the air for fission products that have dispersed through the atmosphere. Japan and South Korea operate their own radiation monitoring networks. These networks will also presumably be looking for signatures of the latest North Korean test. When a nuclear test occurs underground, the fission fragments are trapped except for noble gasses. Because noble gasses don’t react chemically (except in extreme cases), they diffuse through the rock and eventually escape, ready to be detected. In particular, some radioactive isotopes of the chemical element xenon are useful due to the fact these isotopes of xenon don’t appear in the atmosphere naturally, have decay times that are neither too long nor too short, and are produced in large quantities in a nuclear explosion. If you see these isotopes, you know a nuclear test occurred. The amount of information a sniffer plane can determine depends on how much material was released from the test site, how quickly it was released (due to nuclear decay) and how rapidly the sniffer plane got into place. But fission fragment measurements probably can’t tell us whether the bomb tested was small enough to fit on an Intercontinental Ballistic Missile (ICBM). After all, it’s easy enough for North Korea to show a casing in a staged photograph and blow up something else. 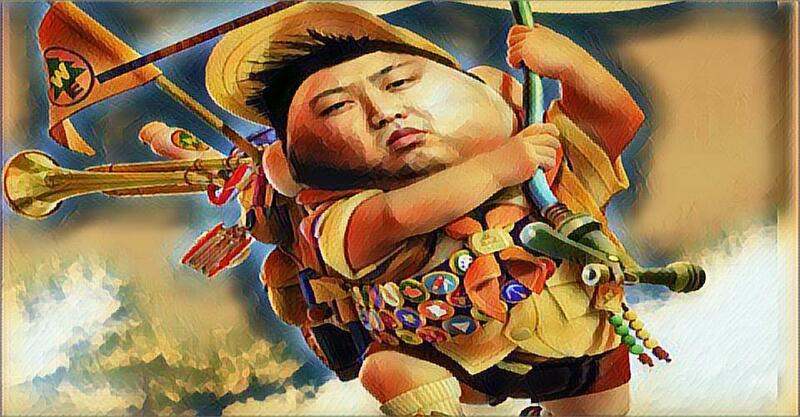 While it remains uncertain as to what North Korea has planned, it will undoubtedly be monitored through each and every phase by the United States of America and its allies.